Ben Thompson could be set for a Millwall recall in January. 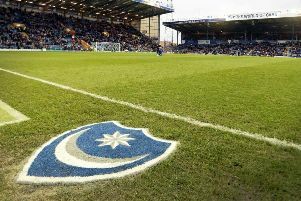 Lions boss Neil Harris is weighing up cutting the on-loan Pompey midfielder’s Fratton Park spell short as injuries mount up at the Championship outfit. Thompson is currently on a season-long loan from Millwall, after arriving in August. He’s already established himself as a fans’ favourite – and a player manager Kenny Jackett believes is central to his League One title push. The 23-year-old has racked up 20 Blues appearances to date, scoring one, and has started the past 11 games in both the league and FA Cup. Jackett admitted in October there was little he could do if Millwall triggered a January recall option which is part of Thompson’s loan deal. The Lions are awaiting news on Aiden O’Brien and Shaun Williams, after they picked up injuries in Sunday’s draw at Bristol City. Meanwhile, Lee Gregory (stomach muscle tear), Tom Bradshaw (knee), Steve Morrison and Tom Elliott (both hamstring) are also currently in the treatment room. Thompson is one of four Millwall players presently out on loan. And speaking to londonnewsonline, Harris said he was weighing up his options. ‘It’s still early days as we’re finding at the moment,’ said Harris. ‘There is no point planning for tomorrow. We’ve literally got to go day by day and game by game. ‘Yes, we have had thought processes and ideas. The boys out on loan – Tom (King), Sid (Nelson), Ben (Thompson) and Fred (Onyedinma) – there is an opportunity for us to call them back in January.